It’s a cold day in Barre, Vermont, but Wilkins Harley-Davidson, the local dealership, is seeing a lot of traffic. The crowds are coming for January’s special event: free waffles with real Vermont maple syrup. John Lyon, Wilkins’ general manager, has switched hats for the day to act as waffle chef. After people finish their waffles and coffee, they generally wander around the dealership. Often, they find something to buy. 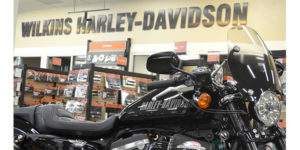 Wilkins Harley-Davidson has been doing business for 70 years. The dealership opened its doors in 1947 after Harry J. Wilkins came home from World War II, and married Barbara. The newlyweds went into business selling Harleys. After Harry passed on, Barbara kept up the dealership, with her son and daughter, Ann Lyon, to help. Unfortunately, the son developed leukemia. John Lyon, Ann’s son (Barbara’s grandson), was working as an attorney, but when the family needed help at the dealership, he came on board. 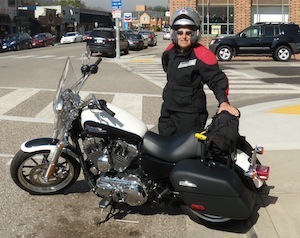 John soon found that being around motorcycles all day was much more fun than the law, and has now been general manager for the last 15 years. “I love every single day,” he says. Both Barbara Wilkins (now 89) and Ann Lyon are active owners, coming to the dealership daily. Wilkins Harley-Davidson has earned the most awards of any Harley dealership in New England, winning Harley-Davidson’s Platinum Bar and Shield Award, given out to the top six Harley dealerships in the United States. MPN asked John how the family-owned business has become such a high achiever and stayed achieving. The answer? A welcome for everyone, regular events to keep interest in the dealership high in every season of the year, and superlative customer service. One of the ways Wilkins has risen to the top is by keeping Legos and crayons in the showroom. The website posts a link to the shop calendar and the shop newsletter on the home page. People in the surrounding area who may not even ride (yet!) go to the website to find out when the next event is. By sponsoring events that appeal to the general public (bike shows, apple bake-offs, photos with Santa Claus and, of course, waffles!) many more people than those who currently ride Harleys show up at the dealership. “We get 500 people at the August bike show,” says John. In addition to regularly sponsored events, Wilkins sponsors the Central Vermont HOG chapter, an active group that holds monthly meetings at the dealership, and also hosts the only Riding Academy (a rider training program designed by Harley-Davidson) in either New Hampshire or Vermont. The three-day class boasts a six-to-one instructor-to-rider ratio. “We are taking future riders seriously,” says John. People who come for one of the general interest events but end up falling in love with a Sportster can sign up on the spot for new rider training. If the prospective trainee doesn’t have protective gear, a specific Wilkins employee is tasked with finding the right (Harley) gear for that particular person. The result of all these activities and events is that Wilkins has become a social hub for riders in the vicinity. The ability to be a destination, and a center where friends meet, is an important advantage a brick-and-mortar dealership has over online stores. Wilkins has invested a lot of time and energy in making the dealership a fun place to go, in addition to being a place that sells parts, bikes and service. The results are obvious. One way Wilkins demonstrates accountability to the customer is with back orders. The goal of the Wilkins service department is to get the customer’s bike back on the road as soon as possible. Not infrequently, the bike comes apart, and a part that is not on the shelves needs to be replaced. If the part is not immediately available from the regional distributor, Wilkins will try to get the part from another dealer. “We drive for hours sometimes,” says John. Customers who buy a motorcycle also get John’s personal cell phone number. He answers the phone unless he is sleeping, eating or riding his motorcycle. The story is still told of the time that John answered the phone while on vacation in Ireland. On the other end of the line was a customer with a mechanical problem. John explained how to get the problem sorted out. When the customer called the dealership the next day to complete the fix, he had no idea that John was out of the country.